Become a Water Warrior! Be a part of an International Multi Media Art/Activism Project in Gaza City! We need to raise $600 a day until August 14th to meet our goals for materials and media production! Donate at: http://igg.me/at/maiamurals Help spread the word to your networks: See sample tweets below. The Water Warriors, who join us for the campaign, will get a water drop dedicated to them in the #Water4Gaza mural painting in Palestine. Lots of information will be forthcoming about concrete actions you can take to leave your mark and participate in this growing movement. Imagine there is no water for up to 14 hours, or more, every day. Imagine that the water you do have is polluted. And then imagine that if you dig a well on your own property you risk being jailed or worse for not having the correct permit. This is what is happening in Palestine where the Israeli Occupation systematically denies Palestinians adequate quality and quantities of water, often diverting it for the use of Israelis. Environmental inequities exist all over the world, including here in the USA. This is why we invite you to join the #Water4Gaza campaign and participate in a global movement for environmental justice! This month, we invite all people who are united in Palestinian solidarity and the universal right to clean water to bring attention to #Water4Gaza through supporting the MAIA Mural Brigade, an art and activism campaign. US based Break the Silence Media & Art is organizing the second MAIA Mural Brigade to Gaza this summer. 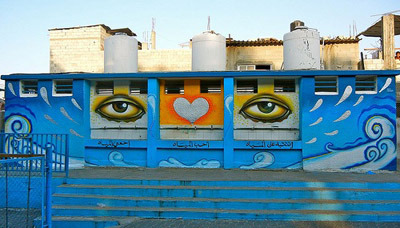 We will create a multi-media public art project with artists, activists and youth from Palestine and around the world. This project aims to spark concrete change and inspire action by partnering with on-the-ground environmental justice organizations in Palestine including the Middle East Children’s Alliance, Emergency Water, Sanitation and Hygiene Group (EWASH) and American Friends Service Committee. We are supported by Estria Foundation’s Water Writes Project. 1.) Join our #Water4Gaza blogger/social media community and commit to spreading the word about the MAIA Mural Brigade with your community.